The website provides information about the author, videos, further reading, and other resources related to the book. One million cells in our bodies die every second—they commit suicide by a mechanism known as apoptosis. Apoptosis is essential for survival of the body as a whole and has critical roles in various developmental processes and the immune system. 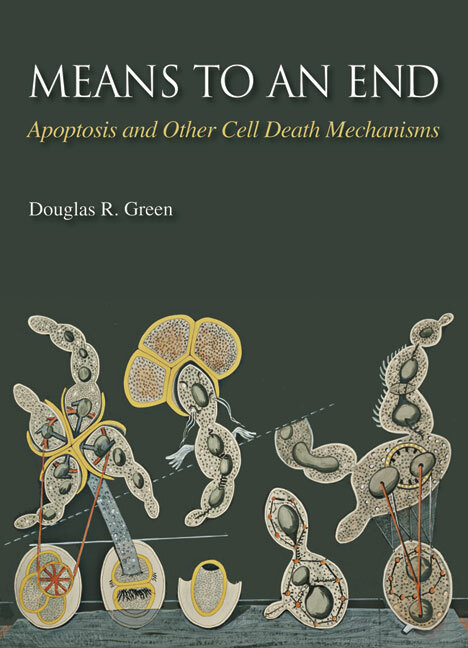 In Means To An End, Douglas Green provides a clear and comprehensive view of apoptosis and other cell death mechanisms. Taking a bottom-up approach, he starts with the enzymes that perform the execution process (a family of proteases termed caspases) and examines their cellular targets and the ways in which they are activated. He then looks at the molecular machinery that links signals that cause cell death to caspases, emphasizing the importance of the BCL-2 family of proteins and the role of cytochrome c released from mitochondria. The final stage of the process, phagocytic removal of dead or dying cells, is also covered. Green outlines the roles of apoptosis and death mechanisms such as necrosis in embryogenesis, neuronal selection, and the development of self-tolerance in the immune system. In addition, he explains how cell death defends the body against cancer and traces the evolutionary origins of the apoptosis machinery back over a billion years. The book is thus of great use to all biologists interested in how cells function in the context of multicellular organisms and will appeal to everyone from undergraduates encountering the topic for the first time to researchers actively working in the field. This book gracefully covers a wide variety of subjects and, in my opinion, distills our knowledge of cell death into an accessible text that is both enjoyable to read and appropriate for a broad audience.